Another hectic week of running around to meetings, giving talks and trying to catch up on admin. With regards to the latter, the ultimate irony of neoliberal attempts to undermine, hollow out, and hold to account bureaucracy is that it creates way more bureaucracy through audit and accountability trails. What that means is a lot of time filling out forms about how I've spent my time filling out forms or attending meetings. I suspect that we've never had so much bureaucracy and so many bureaucrats as at present. Is that a good thing? I guess that depends on whether you're a bureaucrat or not. Personally, I'd prefer to spend my time doing something more productive, such as delivering on the core mission of the job. Okay, rant over! Back to compiling a list of bureaucratic tasks I still need to complete. As suddenly as the roar of the tornado had been on them, it had vanished, replaced by the staccato of rain on the shelter doors. He levered open a door and gazed out at the devastation, momentarily lost for words. Dean Drayhart is an unlikely candidate for death row. 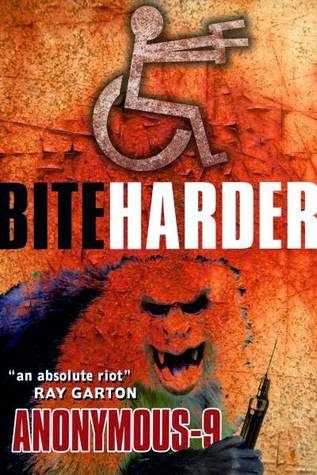 A paraplegic after a hit and run incident that killed his daughter, Dean turned vigilante, tracking down hit and run drivers and administered lethal justice via the vicious teeth of his helper monkey, Sid. One of those he dispensed with before being taken into police custody was the son of a Mexican Mafia boss. Orella Malalinda wants Dean sprung from jail, and Sid and his call-girl girlfriend, Cinda, ensnared. Then she wants revenge. And what Orella wants, she is used to getting. Bite Harder starts pretty much where Hard Bite ended and I think it’s fair to say that the books should be read in sequence. If you need to catch-up, this is no bad thing as Hard Bite is excellent - original, witty, smart, dark, and hard with a soft-centre (see my review). Bite Harder has the same traits, though the balance of the plot is more action orientated, with a little less reflection, and told from multiple perspectives as the various characters seek or flee each other, eventually converging on an epic finale. The pace is high throughout, there’s plenty of twists and turns in the plot, and the narrative is laced with black comedy. I would have liked the cop thread to be filled out a little, spent a bit more time with the folks in the old people’s home, and also got a little more back story with regards to a couple of characters, but these are minor quibbles. Bite Harder is a lot of hard hitting fun and hopefully Dean, Sid and Cinda will reunite for a new adventure shortly. The stated aim of Dataclysm is to introduce lay readers to the era of big data, the possibilities of such data, and the types of analysis used to make sense of them. The problems with the book start with the title and subtitle, neither of which, I think, make much sense. 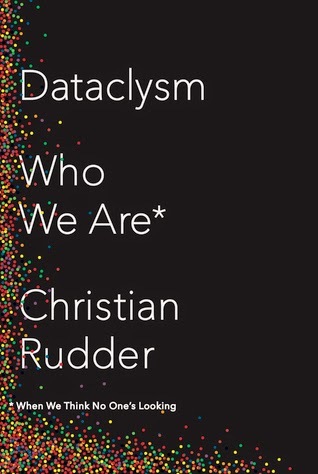 Dataclysm, Rudder explains, is a play on cataclysm: the wiping away of one era to be replaced by a new one. However, big data is set to complement small data, not wipe them away as small data are generated to answer specific questions rather than being a by-product that is then repurposed, and most big data are held by private corporations or government and are not readily open to researchers. All of the data that Rudder analyzes is from social media; they are data produced precisely because we think someone is looking (for a date, for conversation, for information, to provoke a reaction, etc). Uploading information to the internet is largely a process of the presentation of the self, as Goffman’s famous theory would frame the activity. Even if other people cannot see the answers to direct questions, as when filling in questions on a dating site, the answers shape the user profile and the process of matching -- something that users are aware of, consider and present to. 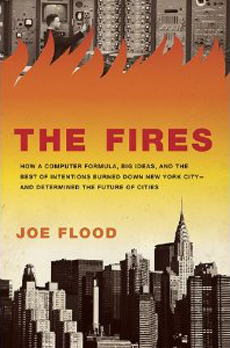 The book then proceeds by discussing social media data and what they might reveal about human behaviour and society. Crucially, however, there is no systematic discussion of big data per se, its forms and characteristics, no discussion of data analytics, and only a cursory discussion of the many ethical, social and political implications of such data. There is no discussion of statistics, or statistical tests performed on the data presented, nor data mining, data analytics, machine learning, pattern recognition, profiling, prediction, etc. The irony here is that Rudder’s company – OkCupid – employs these techniques to be able to process and match potential partners, yet he never explains how this is achieved. Instead, the entire analysis is rooted in the empiricist form of data science, rather than data-driven science, and never proceeds beyond description. As such, the analysis of gender and race he presents are based on a ‘letting the data speak for themself’ approach and constitutes armchair interpretation. He barely engages with the vast academic literature on quantitative analysis of race and gender that has taken place for several decades using large data sets such as the census or public administration data. Rudder has access to an enormous set of very interesting data that could be used to conduct some fascinating sociological and psychological analysis. Instead what we get are a series of descriptive statistics and banal revelations, most of which are already well established. The result is a book that hints at the potential of big data and data science but undersells it substantially, and it under-estimates in my view the readership level of its potential audience by never progressing beyond mathematics and data visualisations used in junior school. In contrast, books such as The Signal and the Noise by Nate Silver provide a much wider and deeper discussion. This is a shame as Rudder is an engaging writer and he has privileged access to an extremely rich social data that could be used to conduct some wonderful and sophisticated social science research. Such rich research and its policy implications are barely hinted at. If those have whetted your apetite then 280Steps have an introductory sales price of $2.99 for e-copies to attract early readers via Amazon UK, Amazon US, Amazon CA, iBooks. You can also purchase as a paperback via usual outlets. If you are a book blogger and you are interested in a review copy then leave a comment or email me and I'll arrange for a copy to be sent to you. ‘It’s not safe.’ Jamie gripped the frayed rope and stared down between the slippery, broken slats at the quickly moving river. Jamie ignored the jibe and slowly turned around. He didn’t mind a dare, but wasn’t going to risk his life for one. A board snapped behind him, the rope bridge swaying. He glanced back. Dan was dangling beneath the bridge, his feet inches above the river. It’s April 1945 and three and a half years since American journalist, John Russell, fled Berlin to Sweden aided by a communist cell, leaving his partner, actress Effi Koenen, and teenage son, Paul, behind. Russian troops are poised to take the city and Russell wants enter with them to find and protect Effi and Paul from the marauding victors, assuming they are still alive. He travels to Moscow to try and persuade the authorities that they would benefit from a Western journalist accompanying them. 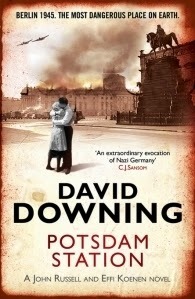 They initially decline, arresting him as a spy, but then decide to give Russell his wish as long as he carries out a mission for them - parachuting into the edge of the devastated city with a scientist, and two NKVD minders, tasked with searching for papers related to the German atomic programme. After surviving for so long under an assumed identity, Effi and the young orphan she’s been caring for, are hoping to see out the war, but the Gestapo seem intent on annihilating all enemies of the state before they are overthrown. Meanwhile, Paul is fighting a desperate rear-guard action as part of the chaotic retreat to Berlin. At eighteen he’s thoroughly disillusioned, but also desperate to avoid pointlessly sacrificing himself for a regime he despises. Russell is not sure how he is going to locate them, especially given the bargain he’s entered into, but he feels compelled to search through the ruins and risk the desperate fighting. The fourth book in the John Russell/Effi Koenen series, Potsdam Station is told through three points of view: Russell, Effi and Paul, Russell’s son from his first marriage. Each new scene switches to focus on one of three. The result is three different views on the fall of Berlin from the perspective of foreign journalist, surviving citizen, and retreating soldier. This is one of the strengths of the tale, along with engaging prose, nice characterisation, a very vivid sense of place and geography, interesting historic detail, a cloying atmosphere, and a visceral sense of desperation as a regime collapses under a fierce onslaught. Nonetheless, the plot is a little far-fetched, particularly the scenario of Russell persuading the Russians to get him into the city ahead of their arrival and Effi failing to maintain her cover to the final fall. That said, despite having a pretty good sense of how the tale would end, Downing keeps the tension high throughout. Further, the first two books in the series were set in 1939 and the third in 1941 and in some ways it’s a shame that Downing has decided to jump forward three and a half years to 1945 for the fourth as I’m sure a compelling tale could have been inserted in that timeframe. Overall, an interesting and entertaining read, with a main plot that’s a little fanciful but a narrative that’s compelling. After a bit of a hunt I found my kindle yesterday, gave it a charge, then downloaded four books from Blasted Heath. Three of their authors have been in my yearly top tens over the past couple of years, and I've been reading the short stories of the other for quite a while, so I thought it was time to catch up with them again. 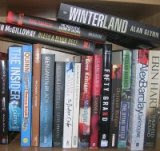 I'm looking forward to tucking into Anonymous-9's Bite Harder, Gerard Brennan's Undercover, Douglas Lindsay's The Unburied Dead, and Nigel Bird's Southsiders. I've already made a start on the first and it's living up to expectation. Somewhat surprisingly it turns out the Stumped is my 30th book. 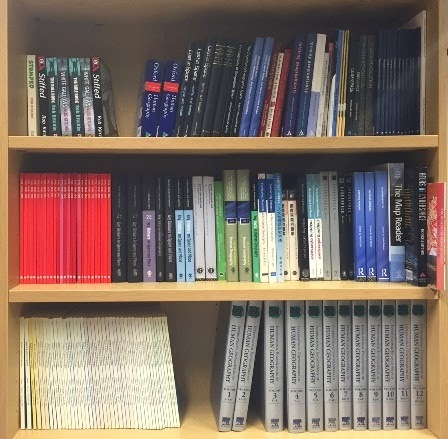 It's my sixth work of fiction (four novels and two collections of short stories) and I've had 24 academic books published (or 36 depending on how the 12 volumes of the encyclopedia and 2 volumes of the handbook are counted): 12 written and 12 edited. (The yellow, red and dark blue blocks on the shelves are issues of journals I've edited). At one level it seems kind of unreal that I've written or edited all these tomes. On another it seems quite banal - that's what I'm paid to do; think about things and write them down, or edit other people's thoughts - and if you write a little each day it soon stacks up. Either way, I think reaching 30 is worth a short post and a toast. I'd say here's to thirty more, but I'm not sure how realistic that is! If you've bought or read any of them, then thanks and I hope they proved useful or entertaining or both. Today marks the officially publication date of Stumped, my new screwball noir novel published by 280Steps. Here's the back cover blurb. It is election time in Ireland and a lot more is about to change for Grant, a new arrival from England, and his wheelchair-bound friend Mary, than their political representatives. Their friend, Sinead, has been kidnapped, and her brother, Pat, has disappeared. Charged with tracking them down, Grant and Mary are soon caught between a vicious Dublin gangster seeking the return of a valuable package and an ambitious politician determined to protect a secret that might harm his re-election prospects. To make matters worse, when someone they confront is found floating face down in the River Liffey, Inspector McGerrity Black, Dublin’s finest rockabilly cop, is soon hot on their trail. With election day looming and Sinead’s fingers turning up on a regular basis they race through County Kildare suburbia, Dublin’s saunas, Manchester’s gay village and rural Mayo, crossing paths with drag queen farmers, corrupt property developers, and sadistic criminal gang members, as they desperately seek a way to save themselves and their friends while all the time staying ahead of the law. "This novel is frantic, fierce and fabulous. Skip the manicure before reading. Stumped is a head-scratching nail-biter that'll leave your fingers chewed down to the nub." You can read a short extract at 280Steps. You can pick up a copy at Amazon.co.uk or Amazon.com or other retailers. From 1942 on the Allies started to systematically bomb the Romanian oil fields at Ploesti flying first from North Africa and then Italy. Given their vital strategic value to the Axis the refineries were heavily defended by flak defences and fighter squadrons and the attrition rate on Allied bombers and crews was high. Many of the crews bailed out over Yugoslavia, occupied by German and Italian troops and divided by complex internal divisions: the Fascist Ustase, collaborating with the Axis, and the Communist Partisans led by Tito and Royalist Chetniks led by Mihailović. The latter two had a different approach to fighting the Axis, the Partisans being more pro-active, the Chetniks biding time until an Allied invasion to avoid severe civilian reprisals, and were engaged in a civil war for control of Yugoslavia post war. From 1943 onwards, the Allies position was to back the more active Partisans and the advice given to airmen was if they bailed out to try and avoid the Chetniks, who were suspected of collaboration. 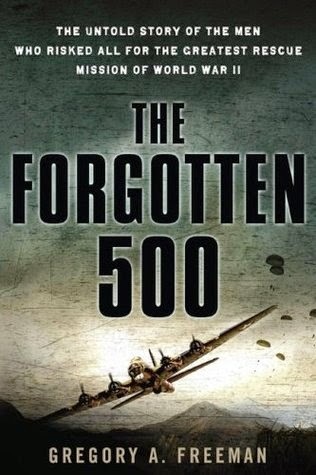 The Forgotten 500 tells the story of the airmen who landed into Chetnik hands and were subsequently rescued by a daring mission organised by OSS and the American Air Force. Despite the warnings given to them, the several hundred airmen who ended up in Chetnik hands were treated as heroes, extended warm hospitality and offered sanctuary. Nevertheless, many were injured, all were hungry, and their presence threatened the lives of local villagers. After a lot of in-fighting amongst the Allies, Operation Halyard was formulated by the OSS to extract them. Three agents were parachuted in and along with the Chetniks and airmen constructed a short runway at Pranjane in the mountains. On August 9th and 10th 272 men were picked up by C-47 transport planes are flown back to Italy. Over the next few months more airmen were extracted bringing the total up to 512 rescued. Freeman’s account of the rescue mission seeks to balance the story of the American airmen in Yugoslavia, with the efforts of the OSS to organize their rescue, and the wider political landscape of Yugoslavia and the Allies relationship to its two main anti-Axis factions: the Partisans and Chetniks. His telling is heavily weighted towards the first two using extended personal stories of a handful of survivors to tell the tale. Some of this material whilst interesting is largely extraneous to the story. On the other hand, the wider framing of the Yugoslav arena and its internal conflicts is quite cursorily dealt with, as is the Communist ring that influenced the Allied position vis-a-vis its engagement with different factions. The latter part of the book deals with events after the war. The victorious Partisans put Mihailović on trial for treason. Those rescued by Operation Halyard petitioned to be able to attend the trial as witnesses for the defence, and even after his execution continued to campaign to clear his name. However, for political reasons the rescue mission was largely kept a secret and little attempt was made to set the historical record straight. Overall, it’s an interesting book, but in my view could have done with a bit of an edit to avoid repetition and redundancy and to frame the mission a bit more firmly in the wider political landscape. The inclusion of some maps (e.g., the flight path to Ploesti, the strongholds of Partisans and Chetniks, a local map of where the rescue took place) would have also been useful. Kasper Meier has survived the war and now shares a small apartment with his elderly father in the ruined city of Berlin. The economy is shattered, people struggling to get by on meagre rations, supplemented with scraps traded for on the black market with other locals and the occupying forces. Meier spends his days horse-trading, swapping household goods and information for food and tobacco, working his various networks. One day a young woman, Eva Hirsch, shows up at his apartment wanting Meier to find the whereabouts of a British pilot. When Meier refuses, she resorts to blackmail. Meier has his own way of dealing with blackmailers but as he tries to short-circuit Eva’s scheme he comes to realise that he’s caught up in something more sinister, as is Eva -- allied soldiers are being murdered on a regular basis. Feeling sympathy for Eva and wanting to extract himself from the threats and obligations being placed on him by Frau Beckmann, Eva’s landlady and rubble clearing leader, and her feral twin children, Meier tries to work out how to save himself, Eva and his father. 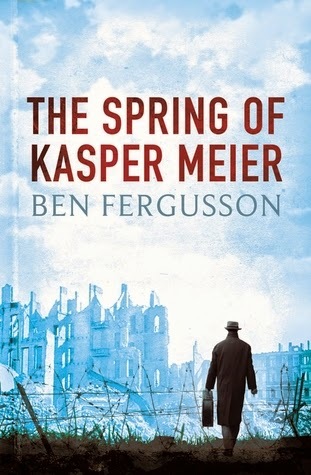 The strength of The Spring of Kasper Meier is the post-war desolate atmosphere of Berlin, the sense of place, and the details concerning how ordinary people seek to survive amongst the rubble on meagre rations. Kasper Meier is interesting character, complex, brusque, tough, yet compassionate, who has long lived a secret life, managing to survive in Nazi Germany. Eva is more open and friendly, a little naive, but with an edge hardened survivor mentality. Their somewhat awkward relationship is nicely portrayed. The plot, centring round find a British pilot and supposed revenge killings is an interesting idea, but its telling is not always convincing and often a little drawn out. The plot hinges on a threat of blackmail that, for me at least, didn’t seem strong enough and the fear exerted by two omnipresent twelve year old twins that did not feel credible, regardless of how feral they’re portrayed. And for someone who has managed to survive, specialises in sourcing information and trading on the black market, and possesses a gun and physical strength, Meier doesn’t always act in line with personality and circumstance. The result was the story felt a little uneven and contrived at times. 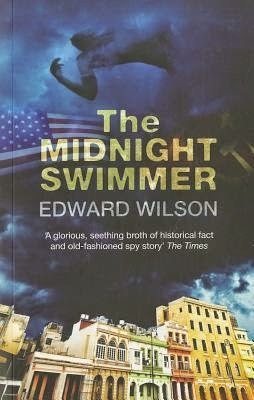 Overall then, an engaging and atmospheric, but sometimes patchy, story of survival and struggle in the ruins of Berlin. "As far as Irish crime fiction goes, Kitchin delivers all the major ingredients: mystery, psychos and a dash of drag queen farmers. This novel is frantic, fierce and fabulous. Skip the manicure before reading. Stumped is a head-scratching nail-biter that'll leave your fingers chewed down to the nub." So, as long as you're not too attached to your fingernails, Stumped will hopefully be an entertaining read. I know it was good fun to write. One brick, rubble, two bricks, rubble, rubble, three bricks, rubble, four bricks, rubble, rubble, rubble, five bricks ... ... ... buckets full. Hannah stood up slowly, stretching her back and thin arms. With cracked and bloody hands she grabbed hold of the bucket handles and shuffled to the waiting carts -- bricks into one, rubble the other -- then trudged back to her spot. A dozen scrawny women were clearing the collapsed building by hand. When Harry Flashman is expelled from Rugby School for drunkenness he opts for a career in the Army, his rich father buying him an officer’s commission in the 11th Regiment of Light Dragoons. They have just returned from India and are unlikely to posted overseas again in the near future. However, Flashman is a natural at attracting trouble and he is soon sent to Scotland to cool his heals where he beds a factory owner’s daughter. Forced into marriage by her family he is drummed out of the Dragoons for marrying a commoner and posted to India. There his talent for languages lands him a meeting with the Governor-General who makes him an aide to General Elphinstone, who is heading to Afghanistan to take over command of the British Army there. Flashman arrives just in time to participate in the biggest disaster to befall a British Army, the 1842 Kabul retreat that witnessed the death of 4,500 troops and 12,000 supporting civilians. But Flashman is a survivor and manages to cover himself in glory, despite the calamity surrounding him. 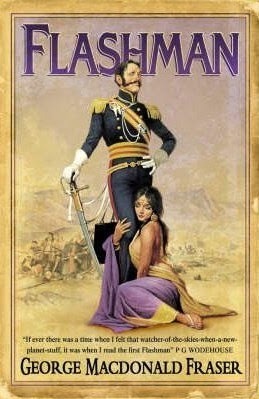 Flashman was published in 1969, purporting to be the first instalment of the recently discovered reminisces of Sir Harry Paget Flashman VC KCB KCIE. The story starts with setting the record straight on his expulsion from Rugby School, as recounted in Tom Brown’s School Days published in 1857 by Thomas Hughes, and then follows his exploits from the time he entered the British Army as teenager to when he returns to Britain two years later having taken part in Kabul retreat. Flashman is an interesting character. Six foot two and handsome, he’s a self-acknowledged scoundrel, liar, cheat, thief, bully, coward, and toady. Openly misogynist and racist, he claims only three natural talents: horsemanship, an ear for languages, and fornication. To that should be added luck and cunning. He has a habit of getting himself moved into harm’s way, but always somehow manages to survive, usually through someone else’s bravery and then claiming credit and glory. He would be an easy character to dislike except that he is also self-deprecating, brutally honest, something of an anti-hero, his wife has the measure of him, and his account has a nice dose of wit. The story is undoubtedly politically incorrect, but knowingly so, and also true to attitudes of the time, and it is full of adventure and scrapes. It is also chocked full of well researched historical detail, Fraser using Flashman to tell the story of the disastrous retreat from Kabul and the First Anglo-Afghan war. It’s one of those tales that that anyone familiar with political correctness feels they shouldn’t really like, but it’s telling means that one can’t help but doing so. A quite varied month of reading. The stand out book was Shuichi Yoshida's Villain, which I found a thoughtful literary crime novel. I spent part of last week in Erlangen and Nuremberg giving a talk. On Thursday morning I had a walk round Nuremberg, a formerly grand medieval city partially rebuilt in its former style after the Second World War, and site of the Nuremberg rallies, laws, and trials. The old parade grounds are a little odd to wander through. On the one hand they need to be left as a reminder, on the other they need to be stripped of their symbolic value. The solution seems to be to let them slowly decay whilst enfolding them into other everyday uses as a park, playing field or a truck car park. The result is a weird kind of estrangement: of being somewhere mundane and significant at the same time. She paused as the dull thud of an artillery barrage pummelled a distant district. The two sisters sneaked out of the chilly basement and watched seven bedraggled boy soldiers scurrying over the rubble heading toward the suburbs, trailed by two children blowing into battered bugles.